A doctor's stomach flu turns out to be a warning about a food-borne illness carried by the world's warming ocean waters. 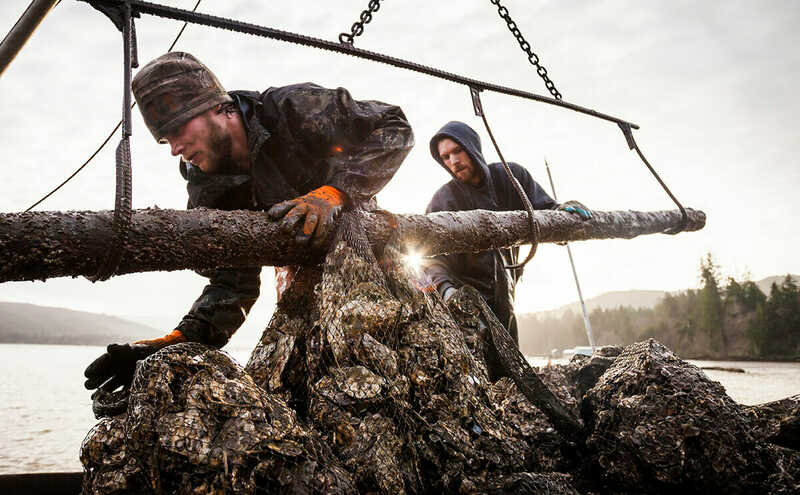 Matt Blaine and Gavin Maxwell of Herrold Fish & Oyster Co. transplant oyster on Willapa Bay. In the summer of 2004, a physician in Nevada was not feeling well. The cause of his illness would turn out to be far more interesting than your typical stomach flu. He had just returned from vacation in Alaska’s Prince William Sound. Onboard a 78-passenger cruise ship, he traveled amidst glacier fjords east of the Kenai Peninsula, feasting on Pacific oysters and other coastal delicacies for three nights. While on the boat, he began suffering the symptoms of gastrointestinal distress, including stomach cramps and explosive, watery diarrhea. Back at home, the doctor ran tests for E. coli, salmonella, shigella, campylobacter – all the usual suspects – but the tests were negative. He ran a second test to detect something more exotic. 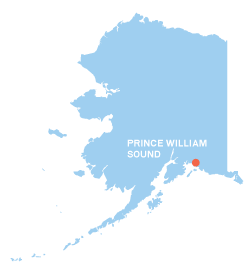 That test showed that he had Vibrio parahaemolyticus, or Vp, a pathogen almost never seen as far north as Alaska. It is transmitted to humans mainly via raw mollusks, particularly oysters, like the ones the doctor swallowed on his cruise. An average bout of Vp lasts about three days (an eternity on the toilet) and requires no antibiotics, just plenty of water and rest. While the personal repercussions for the doctor and the other estimated 62 cruise-goers who ate the tainted oysters might not seem huge – Vp, after all, is rarely fatal – researchers see this incident as a very big deal. In 2005, it became the subject of a widely read paper in the New England Journal of Medicine. Researchers think Vp might be the canary in the coal mine, the bellwether, a bacteria whose increase can serve to illuminate other disease risks posed by warming waters. “Vibrio species are the poster child for the impact of climate change on pathogens,” says Dr. J. Glenn Morris, director of the Emerging Pathogens Institute in Florida. And oyster lovers will bear the brunt of this disease’s widening net. 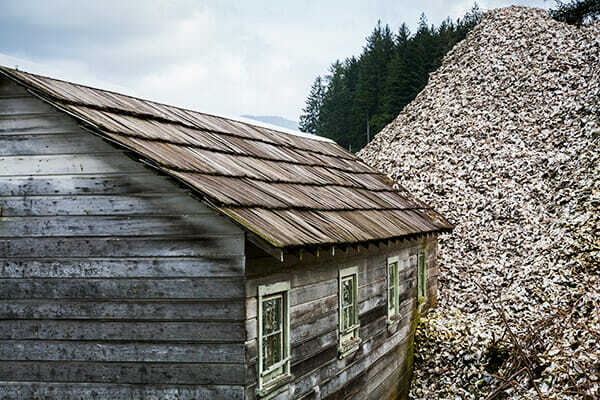 A storage shed is dwarfed by a pile of oyster shells. 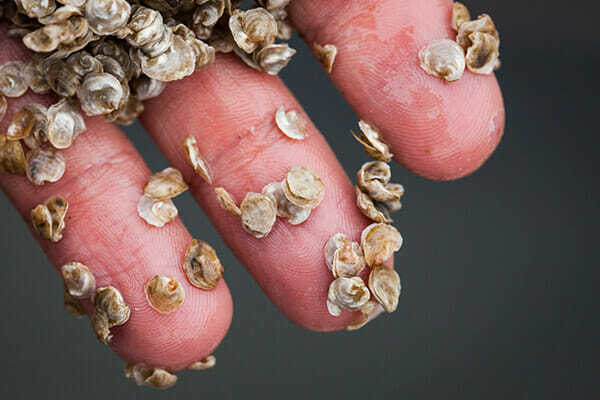 A six-month-old Olympia oyster seed. 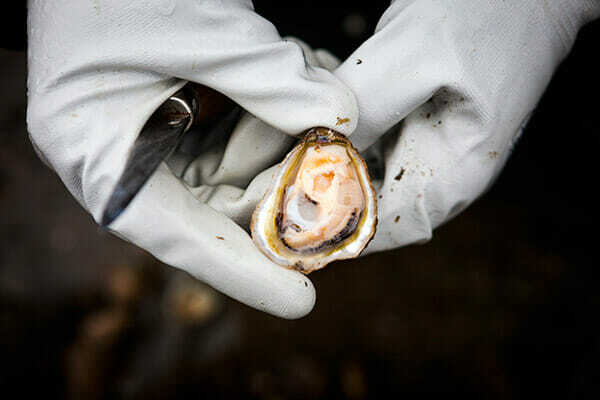 A fresh Olympia oyster is shucked. 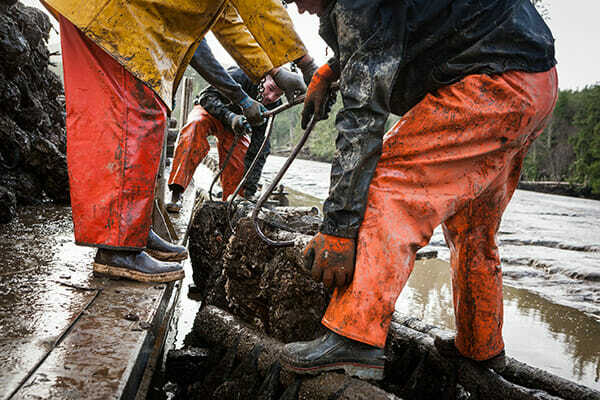 Farming oysters in Washington State. Vibrio is a group of microscopic bacteria that like warm waters along coastlines. When some strains are eaten or otherwise ingested by humans, they can make people very sick. One species, Vibrio cholerae, or cholera, kills over 100,000 people annually, disproportionately hitting places that lack modern hygiene and sanitation. Its pathogenic cousins, Vp and Vibrio vulnificus, have also been found lurking in Florida, Vietnam, Israel, Peru, India and Spain. While other bacterial illnesses (like salmonella, E. coli, listeria, STEC 0157 and campylobacter) have been decresing, Vibrio is on the rise. Why? Researchers believe that climate change, and the resulting warming ocean water where this particular bacteria thrives, is the culprit. Vibrio is now the fastest growing foodborne illness in the U.S. In 2012 the U.S. Centers for Disease Control and Prevention’s disease trackers – using the surveillance network FoodNet, which peers deep into outbreaks, like the PRISM of pathogens – observed a 43 percent increase from the rates reported from 2006 to 2008. For every reported case of Vp, the CDC says another 142 probably go unreported or undiagnosed. Globally, the incidence rate also appears to be increasing, as Vp has spread, most likely on ship ballast water, to at least five continents. It has caused outbreaks of as many as 10,000 cases in Chile, a place where the bacteria wasn’t considered a problem as recently as 2001. Savvy shellfish eaters might think that the rule of R months – the saying that oysters should only be consumed during colder fall and winter months, the ones with an R in the name – might save them from getting sick. But this is an imperfect buffer as ocean temperatures rise. While debate over what is causing global warming remains heated (no pun intended), the fact of hotter waters is unequivocal. 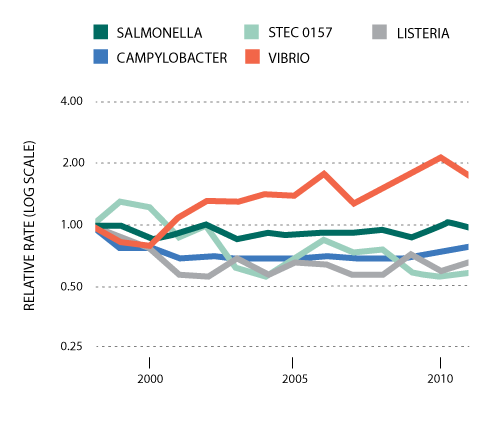 For the past three decades, sea surface temperatures have been at their highest since reliable measurements began in 1880. According to two 2013 studies, in the journals Microbial Ecology and Nature Climate Change, the geographic range where illnesses are caused by the bacteria continues to expand. Farmers on Cape Cod, Massachusetts, for instance, report pathogenic strains in more abundance than they’ve ever seen before. The Alaskan story doesn’t have a happy ending. Alaskan oyster farmers now sink their cages farther below the surface whenever the temperature exceeds the Vp threshold of 59 degrees. Still, every year brings reports of Vibrio and its family sickening people in new places. Cholera has recently been found in Iceland for the first time. More and more, it seems that the bacteria’s jaunt in glacial Prince William Sound is the stomach-churning prequel to life in a warmer world.